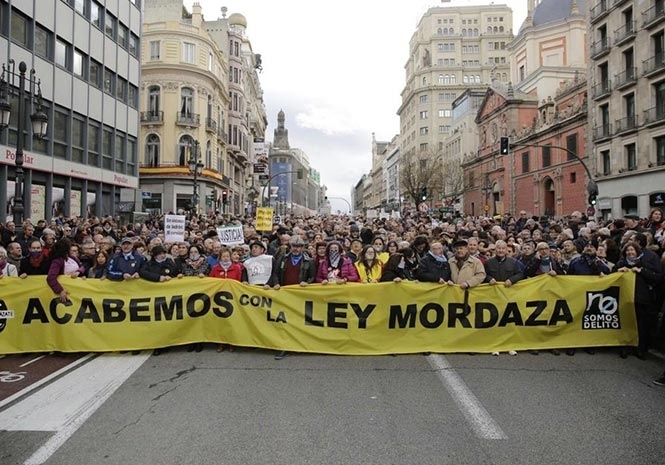 SPAIN’S government is planning to reform a law that gives police the power to hand out sanctions which have been used to ban demonstrations outside parliament among other measures. Prime Minister Pedro Sanchez’s left leaning Partido Socialista (PSOE) is reportedly in talks with other parties in Spain’s Congress to work towards reforming the Citizen Safety Law passed in 2015. The PSOE is aiming to repeal some of the provisions of what the party has branded a ‘gag law’. Sanchez described its reform as “urgent” during no confidence debates on his predecessor Mariano Rajoy last month. “The government that emerges from this no-confidence motion will start work on repealing the most virulent aspects of the Gag Law,” he said during the debate. A PSOE group of three deputies in Congress has reportedly been put together to help gain backing from other parties for the law change. The Basque Nationalist PNV party is leaning towards modifying the law to include protections for protests and trade union activity. The centrist Ciudadanos are also in favour of this approach. The PSOE and leftist Podemos would prefer to repeal the law all together and return to measures set out in an earlier citizen safety law passed in 1992. The Citizen Safety Law was brought onto the books by the conservative Partido Popular (PP) when it was in government. Its provisions included the restricting of demonstrations near the Congress or Senate, taking ‘unauthorised’ pictures of police officers, stopping evictions and non-violent protests such as sit-ins. Breaking the law could land someone found guilty of doing so fines ranging from €100 to €600,000 for the most serious offences. The PP argued it would make demonstrations freer because it would keep violence out of them. The PSOE, then the opposition party, said the PP was attempting to craft a ‘police state’ in Spain with the law.